Recently Pagid DOT 5.1 has been the preferred choice of brake fluid. A respected name in braking systems, the fluid is relatively inexpensive (compared to many) and has a Dry Boiling Point of 269 degrees C and a Wet Boiling Point of 184 degrees C. With the good brake cooling that the car has fitted the DOT 5.1 fluid has been excellent in service, offers an excellent pedal and has never caused any issues and never suffer from heat. After some further research a couple of fluids from ATE were picked up on the radar; SL6 and TYP200. 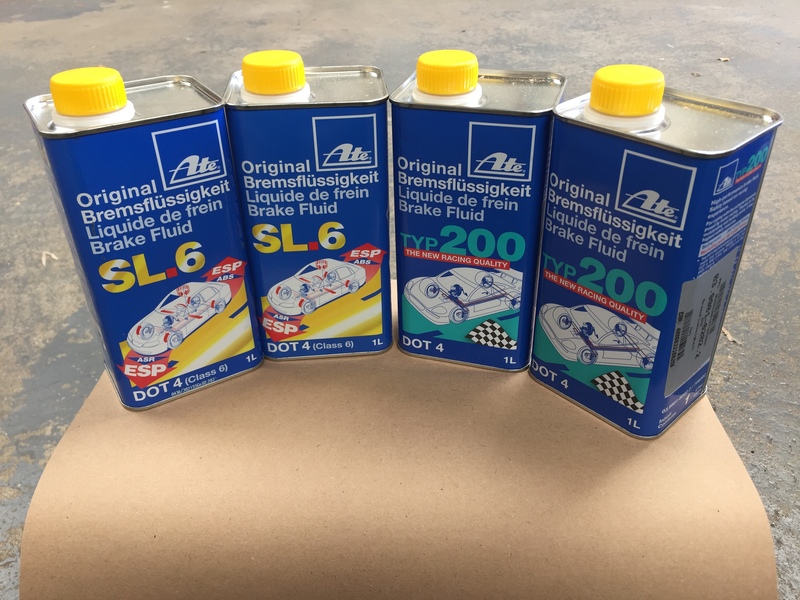 ATE SL6 is specifically designed for cars with ESP and ABS due to its low viscosity and whilst it is a DOT 4 fluid has a Minimum Dry Boiling Point of 265 degrees C and a Minimum Wet Boiling Point of 175 degrees C. More than ideal for road use. ATE TYP200 is again a DOT 4 fluid with a higher viscosity than ATE SL6 of but capable of operating at high temperatures. A Minimum Dry Boiling Point of 285 degrees C and a Minimum Wet Boiling Point of 198 degrees C.
The minimum Dry Boiling Point for a DOT 4 fluid is 230 degrees C, and Wet Boiling Point is 155. For a DOT 5.1 fluid the minimum temperatures are 260 degrees C Dry and 185 Wet. ATE TYP200 way exceeds the minimum benchmark for a DOT 4 fluid and also exceeds DOT 5.1 temperatures, so will be the brake fluid used come the next fluid change. Both types are supplied in metal 1L containers meaning if sealed and unopened have a shelf life of up to 5 years.